See below for Ruskin's comments that the Library Edition "Index to the Plates" (8.xvii) identify as referring to these drawings. In Plate XII., fig. 1, I have given a most singular instance both of rude execution and defied symmetry, in the little pillar and spandrel from a panel decoration under the pulpit of St. Mark's at Venice. The imperfection (not merely simplicity, but actual rudeness and ugliness) of the leaf orna- ment will strike the eye at once : this is general in works of the time, but it is not so common to find a capital which has been so carelessly cut ; its imperfect volutes being pushed up one side far higher than on the other, and contracted on that side, an additional drill hole being put in to fill the space ; besides this, the member a of the moulding, is a roll where it follows the arch, and a flat fillet at a ; the one being slurred into the other at the angle 6, and finally stopped short alto- gether at the other side by the most uncourteous and remorse- less interference of the outer moulding: and in spite of all this, the grace, proportion, and feeling of the whole arrange- ment are so great, that, in its place, it leaves nothing to be desired ; all the science and symmetry in the world could not beat it. — “The Lampp of Life,” 8.199-200. The front of the Doge's palace at Venice is purest and most chaste model that I can name (but one) of the fit application of colour to public buildings. The sculpture and mouldings are all white ; but the wall surface is chequered with marble blocks of pale rose, the chequers being in no wise harmonized, or fitted to the forms of the windows; but looking as if the surface had been completed first, and the windows cut out of it. In Plate XII. fig. 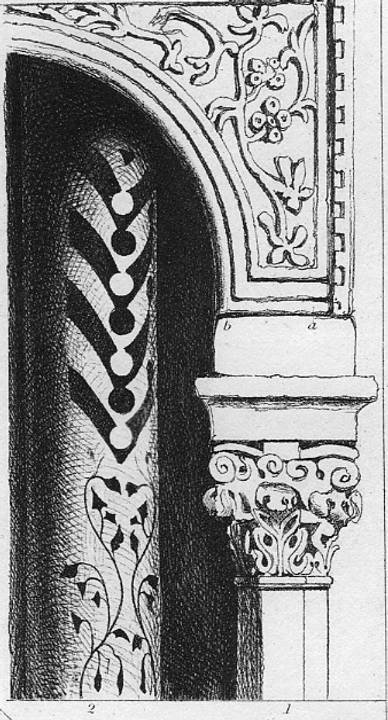 2, the reader will see two of the patterns used in green and white, on the columns of San Michele of Lucca; every column having a different design. Both are beautiful, but the upper one certainly the best. Yet in sculpture its lines would have been perfectly barbarous, and those even of the lower not enough refined. — “The Lampp of Beauty,” 8.182-83.